Morgan Stanley eked out a paltry 2 pct return on equity, worse than peers. Fixed income trading was particularly weak. Client concerns ahead of a Moody’s downgrade may have contributed. Either way, the success of CEO James Gorman’s strategy is starting to look shaky. Morgan Stanley reported second-quarter net income applicable to shareholders of $564 million, or 28 cents a share, falling short of the consensus estimate of sell-side analysts of 43 cents a share. Revenue was $7 billion compared with an estimate of $7.7 billion. Return on equity was 3.5 percent. Excluding a $350 million pre-tax gain on changes in the valuation of its own liabilities, net revenue was $6.6 billion and net income was $338 million, equating to a return on equity of 2.2 percent. The firm’s global wealth management arm booked a pre-tax gain of $108 million from selling Quilter, while the investment bank registered a pre-tax gain of $76 million from hedging adjustments. 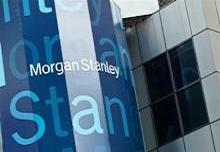 The firm put the measurable hit to revenue of the downgrade by Moody’s in the quarter at $225 million. Compensation as a ratio of revenue for the investment bank was 49 percent after excluding liability valuation gains. Executives expect headcount to be 7 percent lower at the end of the year compared with 2011, implying around 4,100 job cuts. The firm’s overall tax rate was 24 percent.